Tim Kopaz of Watch It Bend Disc Golf helped to design and layout the COURSE. See and like his facebook page at: www.facebook.com/watchitbend. Though early on courses were open areas or cut out woods, new courses have unique topography and are being laid out to make some of the most challenging and strategic courses around. The new courses being constructed at Pioneer Trail Park in Delta County meet these criteria. Rolling woodland topography, amateur and professional lengthened holes, scenic views, and specialty holes like the river island. The early history of disc golf is closely tied to the history of the recreational flying disc (Frisbee). Modern disc golf (Frisbee golf) started in the early 1960’s. Trees were used as targets or Frisbees were tossed into 50-gallon trash barrels. “Steady Ed” Headrick is now regarded as the “Father of Disc Golf” and designed and installed the first standardized target course in California. Headrick coined and trademarked the term “Disc Golf” when formalizing the sport and patented the Disc Pole Hole, the first disc golf target to incorporate chains and a basket. In 1975, Headrick formed the first disc golf association, the PDGA, which now officiates the standard rules of play for the sport. If you haven’t figured it out by now, disc golf is a flying disc game in which individual players throw a flying disc at a target. 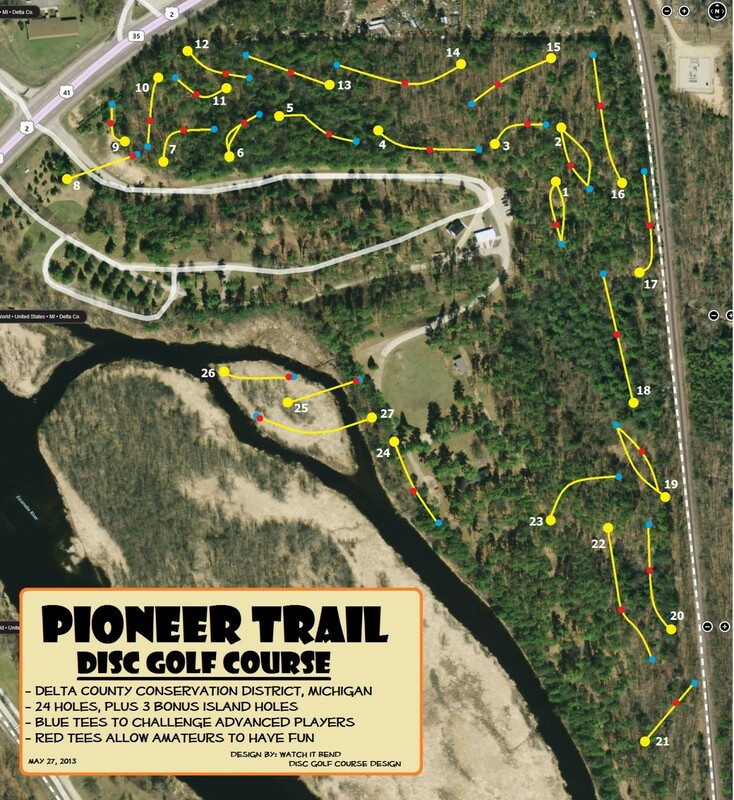 According to the Professional Disc Golf Association, “The object of the game is to traverse a course from beginning to end in the fewest number of throws of the disc”. The number of disc golf courses has more than doubled in 8 years. The game is played in about 40 countries around the world.